This is the first Newsletter of the Southern Africa branch of the Arbuthnott Family Association (AFA) and we hope that you will enjoy reading it enough to contribute news and stories to future editions! One of the aims of this newsletter is to fulfill the ambitions of AFA by keeping family members in touch with their heritage and in touch with news and events within the family. The Southern Africa Branch of the association was established during 2000 and membership currently stands at 45, including 10 Life Members. We hope to attract new members so that we can keep AFA vibrant. The past two years have been filled with intense activity! 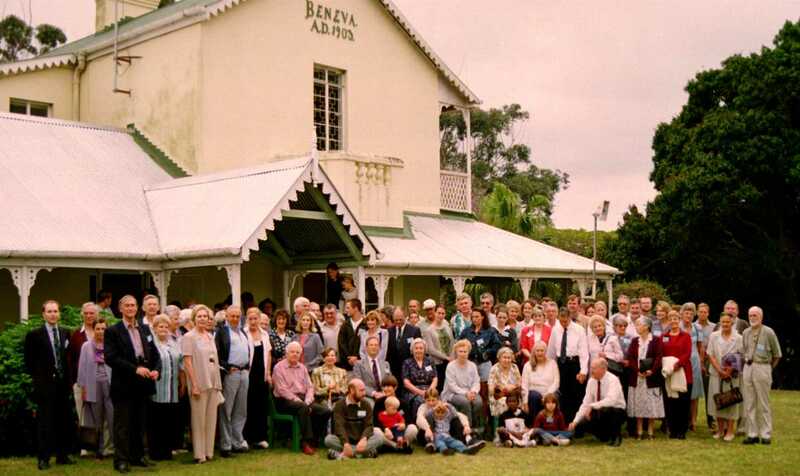 Highlight must be the family gathering held over the week-end of 16/17 September 2000, to celebrate 150 years of the Arbuthnot family in South Africa. Attendance over the week-end was impressive and among the family members and friends was Hon Hugh Arbuthnott and his wife Anne. Hugh is Secretary to the UK Branch of AFA and the brother of Lord Arbuthnott. Hugh commented on his impressions of the family gathering in his "2001 Newsletter" and a copy of this newsletter, reproduced in color for members of AFA, is enclosed. Our gathering was also described by Mark Franklin in the Autumn Issue: 2001 of "The Settler": Journal of the 1820 Settlers Association. Subsequent issues will also cover details of the family gathering. Copies of this journal are supplied to members of The 1820 Settler Association and may be ordered from "The Settler", PO Box 12628, Centrahill, 6006. Many of you who attended the gathering have written to say how much you enjoyed the two days and what a deeply moving and spiritual event you found the celebrations to be. This feedback is greatly appreciated and AFA hopes to arrange similar gatherings in years to come! Our AGM's are planned to give family members an opportunity to meet each other and some details of the first two AGM's follow. the name "Arbuthnot" is derived from Gaelic and means "the influx of a smaller stream into a larger stream". What a wonderful image for us as we, too, seek to play our part, no matter how small, in the life of church and country now: the influx, through us, of a smaller stream into a larger one. We also will need that same sense of "God Everywhere", regardless of circumstance: of ourselves as branches in the vine which is Christ, of God present by his Spirit in darkness and in light - for, as Psalm 139 says, "Where shall I flee from your presence?" Let that Love, which is God, continue to work in us, shaping and fashioning us into the people of faith he wants us to be. And to His holy name be all praise and glory, now and for ever." 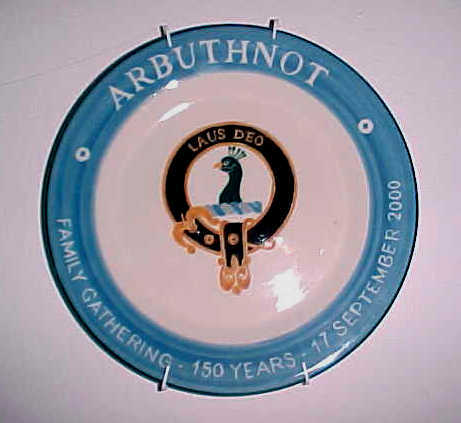 The gathering will take place on the weekend of 17/18 August 2002 and because of the strong "South African" interest shown in this gathering, Hugh has offered to facilitate visits to places of interest for descendants recorded in "Table M" of the Arbuthnot family genealogy, such as to Peterhead. Numerous delays have caused the late publication of the book of "Table M" and unfortunately it is unlikely that it will be available before Christmas. Recommendation: "I was delighted to hand over the detailed genealogical research on the South African branch to Anthony William Arbuthnot, when I met him some years ago. I was acutely aware that I was handing him a skeleton with some errors and without a great deal of flesh on it. But I could not have been more pleased and impressed as I discovered how quickly and how well he would execute the completion of this most excellent work. He has done an outstanding job, always proceeding with great sensitivity and care. He has managed to produce it remarkably inexpensively. I strongly and unreservedly commend his first-class book and urge each of James's descendants to invest in several copies of this definitive tome." William Arbuthnot, Genealogist and Webmaster. It is expected however that copies that have already been ordered will be mailed from January 2002. For those wishing to order copies of this book in the new year, inflation and an increase in the size of the book has led to the price increasing to R100-00 per copy. Postage and packaging has risen to R30-00 inside South Africa and R80-00 for surface mail outside South Africa, R200-00 by airmail. Shirley Van der Laar, a cousin of ours who attended the South African Gathering, runs a pottery studio in the Eastern Cape. She was inspired to create a limited number of plates commemorating the 150 year celebration and she has agreed to fire more plates should any member wish to order any. The price of each plate is R100-00 excluding postage. Please order these plates through AFA and the price of postage will be determined depending on the numbers ordered and the destination. Secure parking is available in front of the Rand Club in Loveday Street (between Fox and Commissioner Streets) and in Surrey House, entrance in Fox Street between Rissik and Loveday Streets. It is hoped that as many family members as possible will attend this event and take the opportunity to meet up with long lost cousins! It will not be restricted to AFA members. Reasonably priced accommodation is available at the Rand Club by prior arrangement. A light snack and a cash-bar will be provided at the AGM and in order to facilitate catering, we ask you please to indicate if you will be attending the meeting and also to indicate the number of people who will be attending with in you before Friday, 11 January 2002. We sincerely hope that you will be there. The second AGM of AFA is scheduled to take place in Durban on 14 June 2002 and we hope to hold future AGM's in other centers in Southern Africa. If you are a member you will receive advanced notice of these meetings otherwise you may wish to check the AFA website for details. Some newsworthy events follow that have taken place during the course of 2001 affecting "Southern Africa" Arbuthnots and their descendants, including descendants of James Arbuthnot of Dens or members who form part of "Table M". Many details are certain to have been missed and it is only with your continued contributions that these activities may be kept updated. The back page of this newsletter is for you to complete your responses and we look forward to receiving these. David Charles Arbuthnot Odette De Heer Kloots Cape Town, 11 August 2001 TM,P11,F.2.c. (now living in Eritrea) TM,P5,C.3.c. Ashton Maritz Drummond Leigh Stein Dundee, 24 February 2001 TM,P4,F.3.b.(A). Lance David Drummond Tamra Goatley Margate, 14 July 2001 TM,P4,F.3.c.(A). Julia Franklin Greg Tew Johannesburg, 3 November 2001 TM,P8,D.4.a.(B). Paul Michael Frodsham Meggan Bell Bulawayo, 15 December 2001 TM,P4,F.2.(C). Alaric "Jake" Taylor Melissa ("Mollie") Jones London, 13 August 2001 TM,P2,B.1.c.(B). Luke Crofton Arbuthnot Trevor & Tanja Arbuthnot Bahrain, 9 October 2001 TM,P11,F.2.a.(A). Troy Riley Drummond Terry & Kerith Drummond 4 May 2001 TM,P4,F.3.d.(A).(2). Ashton Frodsham Andrew & Brenda-Lee Frodsham Johannesburg, 11 April 2001 TM,P4,F.2.a.(A).(1). Hazel Frances Gwilliam Bridget & Douglas Gwilliam 29 April 2001 TM,P4,F.3.b.(B).(1). Susan "Peta" Franklin 20 Cape Town, 26 August 2001 TM,P8,D.4.d.(A). David Eric Arbuthnot and his family Seconded by BMW to China for 18 months 2001/2002 TM,P7,D.2.a. Patrick Brian Arbuthnot Lady Cade Prize: Medical Research 2001 TM,P4,F.6.d. Emily Jane Stainer Heather Martienssen Prize: best Wits Art Student 2001 Johannesburg, September 2001 TM,P10,B.1.a.(C). Publication: "The Descendants of James Arbuthnot of Dens"
Cost of packaging and postage will be determined and is dependant on the size and destination of each order.